The following is based on “Outline of Ryūkyūan Genealogy,” by Dana Masayuki (Okinawa International University). Kafu 家譜 (genealogies) are family trees prepared by the Ryūkyūan gentry since the latter part of 17th century. It is believed that almost 3,000 such genealogies were prepared during the period of the Ryūkyū Kingdom until the middle of 19th century. They were prepared by people from Shuri, Naha, Tomari, and Kumemura, but also from people from the islands of Kume, Miyako, and Yaeyama. A title page was attached on temporary bound pages indicating the clan (by a Chinese surname) and the house (by the Ryūkyūan surname) of the genealogy (O uji kafu 御氏家譜). They were composed of a diagram of the family-tree (seikeizu 世系図) as well as additional family data and biographies (kafu kiroku 家譜記録). Both the words kafu and keizu 系図 were used to describe the genealogies, but generally the term keizu was called, pronounced chēji in Ryūkyūan dialect. The genealogies were written in Chinese characters, but complimentary entries and awards were written in sōrō 書簡 (letter form) which was typical for administrative works. In this instance, Ryūkyūan characters were used, i.e. a mix of Kanji and Kana. They were produced on order of the royal administration (ōfu 王府) in Shuri. One copy was kept by the family; the other copy was kept by the Bureau of Genealogies (keizu-za 系圖座, established in 1689 to compile genealogical records of the royal family as well as of the aristocratic families). The genealogies including their supplements constituted official documents maintained by the Bureau of Genealogies. It significantly influenced to established munchū (門中) which were organizations of paternal blood related families including the adoption of the (Chinese surname) system. The conception of the munchū originally developed from family clans within the earliest Mura village communities. It denotes a family clan based on the paternal line. It also denotes the Okinawan custom of sharing the same tomb and collectively performing related rituals. In the early modern era of Ryūkyū, they constituted one part of the semi-official groups of regional authority involved in all kinds of administrative matters as well as judicial affairs of the region. Terms related are shinzoku shūdan 親族集団, also shinzoku kankei 親族関係 meaning kinship, family relationship, furthermore ichimon 一門 (“one clan”) and munchū 門中 (“inside the gates or family”). The following is a general outline of various events leading to the development of genealogies in Ryūkyū. Between 1641 and 1643 the Kanei Shoka Keizuden 寛永諸家系図伝 was compiled by the Tokugawa shōgunate. It contained the lineages of daimyō, hatamoto, and various gentry families. In 1650, by order of the Ryūkyū king, Shō Shōken (Haneji Chōshū, 1617–1676) edited the Chūzan Seikan 中山世鑑. It was the first official historical chronicle in Ryūkyū, compiled primarily as a genealogical record of the successive generations of Ryūkyūan kings. In 1670, King Shō Tei ordered all his subordinates to edit their genealogies. In 1679, regent Ōzato Ōji corrected the genealogies made by the people. In 1689, the Bureau of Genealogies was established. It defined various systems and started a permanent editing of the genealogies. It is believed that the Kanei Shoka keizuden (Tokugawa shōgunate, 1643) had a significant influence upon the establishment of the Bureau of Genealogies in Ryūkyū. The royal administration first ordered Haneji Chōshū to prepare the genealogy of the royal family, which became the first official history of the Ryūkyū Kingdom, called Chūzan Seikan (1650). Later it was translated into Chinese and further enhanced to represent the historical record of the royal family tree and the title was changed to Chūzan Seifu 中山世譜 (1701–1874). It was continuously updated as the official historical data of Ryūkyū, continued until the abolition of the kingdom. The development of family genealogies began at the time when the royal genealogy started. After several stages of improvement, the permanent system of editing was initiated and established with the founding of the Bureau of Genealogies in 1689. At the time of establishment of the Bureau of Genealogies in 1689, the uji (Chinese surname) was determined based upon munchū as a unit, such as Shō-uji, Mō-uji, Ba-uji, etc. Furthermore, the first Chinese character of the individual given name was also decided. The Shō-uji had Chō 朝 as the first character of the given name. The first character of the given name in Gosamaru’s Mō-uji was Sei 盛, in the Ufugusuku lineage it was An, in the Ba-uji of Kunigami Aji it was Sei, and in Urasoe Uēkata’s lineage it was Ryō, etc. This first character is called nanui 名乗 in Okinawan (nanorigashira 名乗頭 in Japanese). The family names of officials of the kingdom’s administration came from the village or territory of their ruling. As a result, some prestigious families had different family names for each member, as parents, brothers and relatives were separately awarded a village or district. Therefore, the uji name, which originally came from China, was fixed to a munchū to represent a consanguine group. The idea may be derived from the genealogies of Kume village gentry and was a significant characteristic of the Ryūkyūan genealogies. The royal seal of Shuri on the genealogy of “Yara Pechin”. This is the assumed genealogy of Chatan Yara. 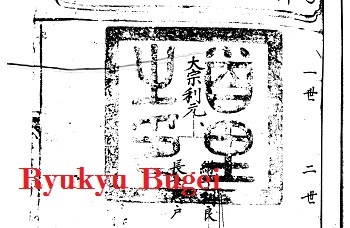 When genealogies were prepared, the administration ordered the gentry to submit two copies of each genealogy to the Bureau of Genealogies: one formal copy was stamped with the “Seal of Shuri” (official seal of the king) and returned to the originator. The 2nd copy was retained by the Bureau of Genealogies. Following the initial submission and registration of the documents, every 5 years personal historical data, koseki 戸籍 (directory of the personal data of a household) and other new additional information were incorporated. This was called shitsugi 質疑 (lit. “question and answer”). All additional data needed a back-up proof. Back-up proofs were also needed at the time of the establishment of a genealogy. Basically all entries made to a genealogy required supporting data. For instance, to register a child, requests with signatures of about ten people of munchū and relatives had to be submitted within one week to establish a seishi shōbun 生子証文 (birth certificate). Occupational experience required to be accompanied by a certificate from the appropriate office. The Bureau of Genealogies carefully reviewed the submitted documents. Misspellings and errors were corrected, remarks added and the package returned to the originator, who in turn corrected and re-submitted two copies of the final documents to the Bureau of Genealogies. One copy was stamped and returned to be attached to the formal copy. A second copy was retained by the Bureau of Genealogies to be filed together with the 2nd (initial) document copy. Such strict inspection and review by the Bureau of Genealogies added strong reliability as a primary source to Ryūkyūan genealogies. They were private genealogies of the kingdom’s subjects, and at the same time also official documents of the kingdom. The establishment of the genealogies clearly distinguished the gentry from the common public. Differences and distinctions in personal status existed before, but it was the system of genealogies the concept of mukei (without family lineage) as a designation for commoners came from. At the same time, strict rules were established as regards the qualification of the gentry. Those who engaged in daily maintenance works, performed agricultural works, lived in the country-side, etc., were subject to confiscation of the gentry status or the downgrade of the family status. This is because they violated the general rule that all gentry must serve the royal administration and must reside in Shuri, Naha, Tomari, or Kume. But these rules were loosened because in reality the administration was not able to provide jobs to all gentry and many members of the gentry moved to the country-side and engaged in farming. In addition, genealogies significantly affected the inheritance system of family lineage: If there was no one available in a household to inherit the lineage, they would seek out a closely related family, and if there was also no one available, they would seek out a remotely related family, and if still there was no one available, they turned to mukei to pick a male successor to continue – albeit artificially – the paternal blood line. The problem of determining a heir was a huge headache for the royal administration. However, taboos of today were not necessarily big problems back at that time. The royal administration made a proper and appropriate job in reviewing the genealogies. It was in more recent years, after the collapse of the kingdom, that the problem became adversely affected by the original rules [?] and is difficult to solve. For individual owners, the Ryūkyū genealogies represent the family register of ancestors and the historical data of the family. The records of the ancestors are related to the understanding of the history of the administration of Ryūkyū. That’s why the genealogies have a high value as historical data. Major events of the administration of Ryūkyū have been written down as official data in official documents, but many of them seemed to have been written based upon genealogical entries. The genealogical data includes the events an official was engaged in as well as his occupational accomplishments. Such entries often describe the event in more detail than official entries in other histories. Something may be discovered by accumulation and analysis of data from a number of these genealogies [which I did for security related duties in Karate 1.0]. Sometimes, there was even only one genealogy, but it showed very valuable information. In addition, 200–300 year old koseki (directory of the personal data of a household) provide us with various data such as marriage, divorce, longevity, changes of name, etc. at each respective period. The value of the genealogies is that they provide us with information from many different areas otherwise unavailable. This entry was posted in Genealogy Studies, Unknown Ryukyu and tagged Chuzan Seifu, Chuzan Seikan, Dana Masayuki, monchu, munchū, Ryukyu Genealogy, 門中. Bookmark the permalink.